I recently did a Space Girl photoshoot with model Annabell Bella and thought I’d share a Photoshop technique that I used. It was based on this YouTube video, but modified for my application. I did all of my normal retouching on the model part off it, but then I wanted the ray guns to actually be shooting something.I wasn’t going for realistic, but rather a retro Sci Fi look like Flash Gordon or Barbarella, with a little Steampunk influence. Create a New Layer. I tried to keep this as non-destructive as possible. Select and configure the gradient tool – Open gradient config by clicking on the gradient in the top tool bar. — Hit Randomize until you get a gradient with different tones. Holding the shift key down and drag from top to bottom of the canvas. This will create a gradient with lots of horizontal lines of color. Desaturate the whole layer. Cmd-Opt-U. Now all those lines are shades of gray. — Grab the top middle handle, hold the shift and options keys down and drag down. — The gradient will compress into the center. Make it the widest size of the beam. Using Free Transform, make it the length you need. You can save after this as it is still horizontal. Just duplicate the layer and hide one of them. Now you can used this layer to do similar beams later. — Move the corners at the barrel so they line up with 2 points on the gun. — Shape the barrel end to cover the circular opening of the barrel. — Put a little curve/narrowing in the beam to look cool. Blur the heck out of the big beam. Blur->Gaussian Blur at 100 px. The bigger beam with almost disappear. This is your glow. It may not be exactly where you want it. Feel free to move it around to make it right. Select the brush tool and pick a brush size about 2x your beam size. Now pick three or four colors and just draw over sections of the big beam in your new layer. Move from the barrel to the end of the beam making little patches of color all the way down. Now – with the color layer selected – do Gaussian Blur. 100 will probably work, but you can mess with it. The beam glow may look a little weak. 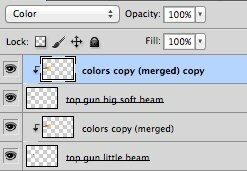 Try duplicating the layer so you have two color layers on top of each other. Try setting the new layer to Overlay or one of the other transfer modes to get some different color and intensities. You may need more than one layer to get the effect you want. If you now have multiple color layers, you may want to collapse them into one. Once you have the beam covered in colors, duplicate your color layer. Move your new color layer over the small beam layer. Put your cursor on the line between the top two layers and hold down the option key. Click on the line and the color will be mask to the layer below it. Repeat for the small beam. Once your color layers are masked/attached to the beam layers, set their layer mode to Color. Now your lines are back in your beam. You should now have a glowy beam. This is just one way to do it and it may not be the look you are going for. Here’s some things you can mess with and tweek try to get a cool beam. If the lines in the beam from the small beam are too distinct try doing a radial blur down the beam to get a better look. Change the opacity of the blurred beam so it isn’t 100 percent. You can also change its size.